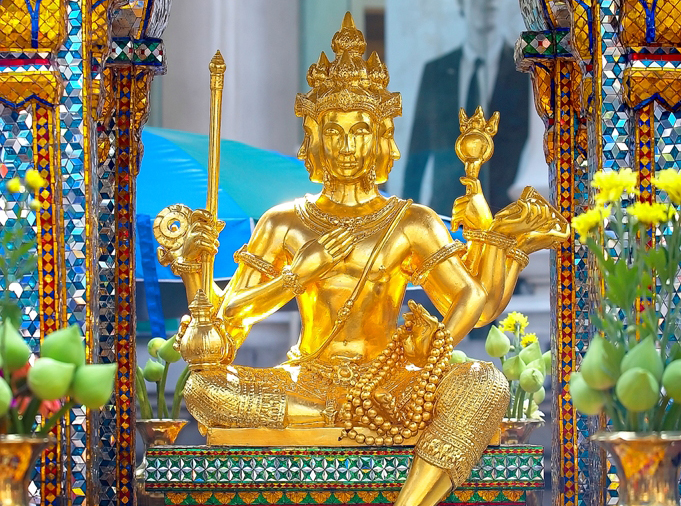 An image of Brahma at the Erawan shrine in Bangkok. The Hindu shrine is popular with Chinese tourists, who were among the victims of the attack. A connection between Uyghur militants from China’s northwest and the August 17th bombing of Bangkok’s Erawan Shrine has been confirmed. Thailand’s police chief made the link explicit during a news conference Tuesday. While the geopolitical consequences of the connection remain to be seen, Beijing could still stand to benefit from the Erawan bombing. However, fears over domestic implications may keep China from using the attack to their advantage. Two men who have been taken into custody in connection with the case are Yusufu Mieraili and Adem Karadag. Mieraili was arrested in late August with a Chinese passport that listed his birthplace as Xinjiang province – the homeland for the oppressed Muslim-Turkic Uyghur minority. The second suspect was found in an apartment outside Bangkok along with bomb-making materials and dozens of fake Turkish passports. Thai police issued an arrest warrant for another suspect from Xinjiang, Abudusataer Abudureheman, on Saturday. The 27 year-old Chinese national goes by the name ‘Ishan’ and is the suspected mastermind of the operation. The wanted poster for Ishan first reported that he was of Uyghur ethnicity, though a second version removed the reference and Thai authorities subsequently asked media to “drop the word”. While the connection between the controversial deportation and the bombing is seemingly bad news for China, there are a number of ways in which the PRC could benefit from this situation. First, the bombing legitimizes China’s domestic anti-terrorism efforts. The Uyghur struggle for autonomy and Beijing’s efforts to contain it has been anything but peaceful. Systematic state-sponsored economic and physical violence in Xinjiang has been met with repeated attacks on police stations, government buildings, markets and train stations, both in Xinjiang and elsewhere. Beijing has long claimed that many of the terror attacks were coordinated by the East Turkestan Independence Movement (ETIM), a shadowy separatist organization allegedly linked to al-Qaeda. The very existence of ETIM, let alone its potency, has long been debated among experts and China has struggled to receive widespread recognition for its fight against domestic terrorism. This is largely due to doubts over ETIM and opposition to China’s repressive policies in Xinjiang. The Erawan attack could change this. Now Beijing can point to the Erawan bombing as credible evidence that Uyghur terrorism is a threat that deserves attention outside of China. By internationalizing the issue, the Chinese government can rationalize its repeated crackdowns on Uyghurs to an international community which has been critical of its past policies. Now, Uyghur terrorism is an international issue that affects everyone – Bangkok was the world’s most visited city in 2014, after all. Additionally, with an internationalization of Uyghur terrorism comes more opportunities for cross-border cooperation. Sino-Thai relations, already made closer by new trans-boundary infrastructure projects, will undoubtedly be strengthened by the Erawan attack. In February 2015, a counter-terrorism cooperation pact was signed between Indonesia and China following the repatriation of four Uyghurs accused of planning the Kunming train station attack. A similar agreement is a likely consequence of the Erawan attack. International cooperation in combating (and sometimes creating) terror networks has been a lowest-common denominator of sorts for inter-state relations in the 21st century and China should take advantage of this. In the past, China has used links between Uyghur militants and terror cells in northwest Pakistan to strengthen relations with the South Asian state. In light of the Erawan blast, Beijing could coordinate its counter-terrorism efforts with Washington. Sino-US relations have noticeably worsened in recent years, and counter-terrorism, aside from global warming, may be the safest area for increased cooperation between the two regional rivals. Coordination of border control efforts in Southeast Asia, particularly along China’s southern boundary is another area of possible cooperation. Uyghur migration through southwest China into Southeast Asia is a relatively new trend, and the number of migrants has swelled in recent years. Refugees have been known to use existing smuggling routes out of China and through Southeast Asia, exploiting porous borders and corrupt guards on the way. With the specter of international terrorism looming, China and its southern neighbors could increase cooperation along the margins. This would particularly benefit China’s ties with Myanmar and Vietnam, two countries with strained relations to Beijing. Historically, Southeast Asian governments have acquiesced to China’s demands for detained Uyghur refugees to be repatriated and many observers presumed that the trend would continue along with China’s rise in regional influence. However, there is wide speculation that the attack at the Erawan Shrine, a site popular with ethnic Chinese, both Thai and tourist alike, was executed in retaliation for Thailand’s deportation of Uyghur refugees. The repatriation of 109 Uyghurs from Thailand in July led to condemnation from human rights groups and protests at China’s consulate in Istanbul, where nationalist Turks see Uyghurs as their pan-Turkic brethren. After Erawan and Turkey’s summer protests, Southeast Asian governments will likely reconsider any future deportations for fear of similar retribution. Internal worries over the consequences and implications of the Erawan blast may explain Beijing’s continued silence over the incident. While news of the attack did feature prominently in Chinese media in the days following the blast, there has been scarce coverage of the subsequent investigation, let alone the identity of the alleged attackers. Moreover, Beijing has actively denied Uyghur links to the Erawan attack, calling such speculation “hugely irresponsible” in the days following the explosion. Following the Tuesday statement from Gen. Somyot, there has been no mention of the Uyghur link to Erawan in the Chinese press. China’s fears are not without merit. First, that the attackers hail from Xinjiang could be a point of embarrassment for the Chinese government. The crisis in northwest China has grown worse by the year – 2014 saw the expansion of Uyghur violence out of Xinjiang to the rest of China – and 2015 has now brought an international attack linked to the Uyghur separatist movement. In the past, Beijing has refrained from mentioning the ethnicity of suspects in domestic attacks for fear of stoking ethnic tensions. Similar concerns are likely influencing China’s actions post-Erawan. Implicit in China focusing at all on the attack’s connection to Xinjiang is an acknowledgement of failure in solving the country’s ethnic problems and an admission of partial culpability. The government is already having enough trouble convincing its citizenry that it is capable of guiding the country through an economic slowdown – adding more doubts over ethnic and security issues is the last thing Beijing wants. The lack of coverage of the investigation in China has been mirrored by Thai authorities’ previous reluctance to link the explosion to Uyghur separatism, and its continued avoidance labeling the attack as terrorism. This, like China’s strategy, is likely targeted at the Chinese public. The number of Chinese visitors to Thailand has exploded in recent years and the money they bring has been a welcome addition to the country’s economy as other sectors have faltered since a military junta took power in 2014. News of a bomb in downtown Bangkok was always going to affect tourism numbers, but connections to Uyghur terrorism will undoubtedly cause many prospective Chinese visitors to think twice before booking flights to the kingdom. What’s more, Thailand’s handling of the case has raised questions of Chinese involvement in the case. The delayed official announcement of the Uyghur and the offiical waffling over the ethnicity of the suspects signaled to some that China had an affect on the investigation. Further, Thai officials asked media to avoid analysis that might affect “international relationships,” interpreted by many to mean China. A coordinated response by Bangkok and Beijing would make sense. In addition to being the source of millions of tourists each year, China is Thailand’s largest trade partner and the closest ally of its military government. Now that Bangkok has shown its hand, Beijing’s response will be critical to watch. Political savvy on the part of China’s foreign ministry could turn an international tragedy into an opportunity for more positive ties with Southeast Asia. However, the domestic implications of publicizing the link between Xinjiang and Erawan shrine will likely keep Beijing silent for now. This year, Jakarta earned the unsavory title of “World’s Worst Gridlock.” The city of 23 million is now reputed for having to most congested streets in the world. Another Indonesian city, Surabaya, took the number four spot. If you continue down the rankings to number eight, you will find yet another Southeast Asian metropolis – Bangkok. The tendency for gridlock in these cities is more than a daily inconvenience for residents. 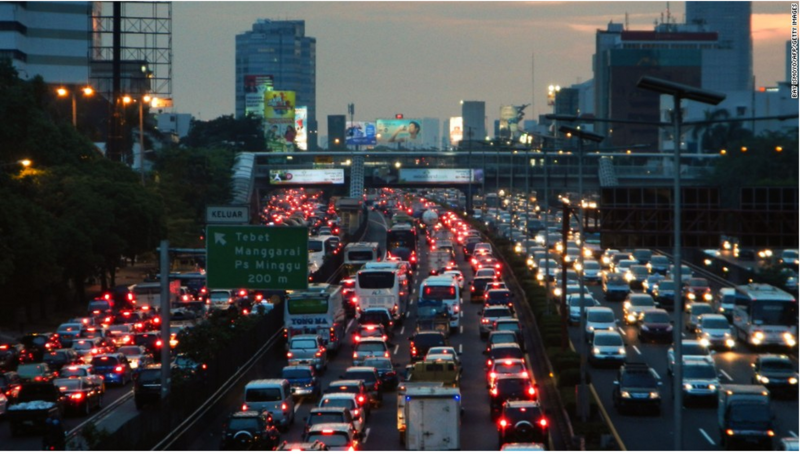 These levels of traffic congestion are indicators of a trend in the wider Southeast Asian region. In this part of the world, urban populations are growing faster than municipal and national governments can handle. When managed sustainably, cities can be a valuable vehicle for economic development and socio-demographic transition. For example, cities can facilitate productive trans-border connections and slow birthrates, which enables more women to enter the workforce. Nevertheless, urbanization is a double-edged sword. Rapid, unplanned growth results in unsustainable development that threatens social, economic, and environmental stability. In a landmark report that analyzes 10 years of urbanization data from East Asia, the World Bank suggests that urbanization in East and Southeast Asia will have “long-lasting effects on the region’s social, economic, and environmental future.” Understanding the growth trends in Southeast Asia will boost the region’s ability to avoid the pitfalls associated with the rapid type of urbanization that has been observed over the past decade. In other words, the region needs to pay attention to these changes if they don’t want to spend the rest of their down time stuck in traffic. 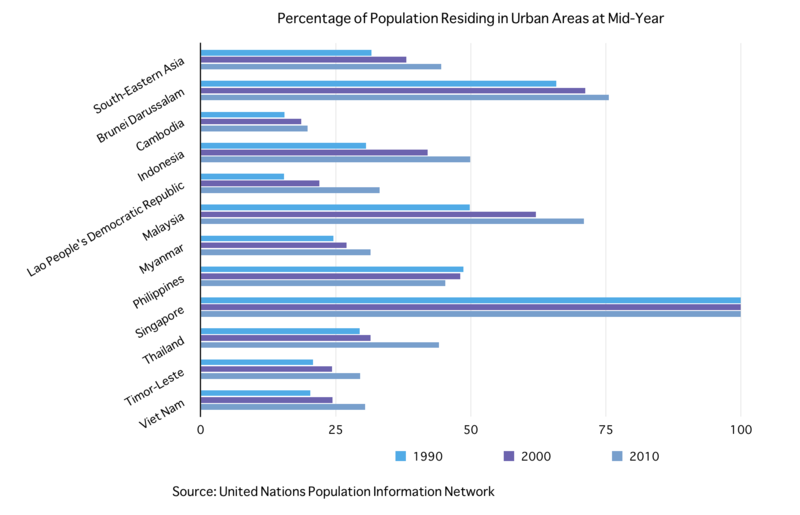 Between 1990 and 2010, Southeast Asia increased its urban population by at least 12%, per United Nations estimates. The fact that Asian cities are growing is not a fresh realization, but few observers of these phenomena have questioned how these cities are growing, instead of just how big. For example, in the past 10 years, East Asia has experienced more urban growth in small- and mid-sized cities than in major metropolitan areas. This has several more nuanced implications for the region. Successful development in smaller metropolitan areas could relieve much of the pressure put on high-population areas. For example, a Thai development strategy used tax breaks to encourage people to take up residence in the regions outside of Bangkok . Unfortunately, the government failed to provide infrastructure and facilities to support business development in outlying regions. Bangkok remained the prime area for investment, and the program floundered. Megacities like Bangkok often gain international reputations that afford them opportunities to advertise for foreign direct investment.Small and mid-sized cities, on the other hand, have to fight for attention and funding from national governments and lack the resources necessary to advertise to a wider range of investors. Take the case of Ho Chi Minh City and Da Nang, two metro areas in Vietnam. Ho Chi Minh City is the country’s largest city and Da Nang was only about an eighth of HCMC’s size in 2011. However, the rate of urban population change in Da Nang was 4.5% as of 2010 and HCMC was 3.9%. While this may appear to be a narrow margin between two cities, imagine the national impact when every mid-sized city in a country grows at this rate. The need for infrastructure would surely outpace the investment available to these smaller metropolitan areas. 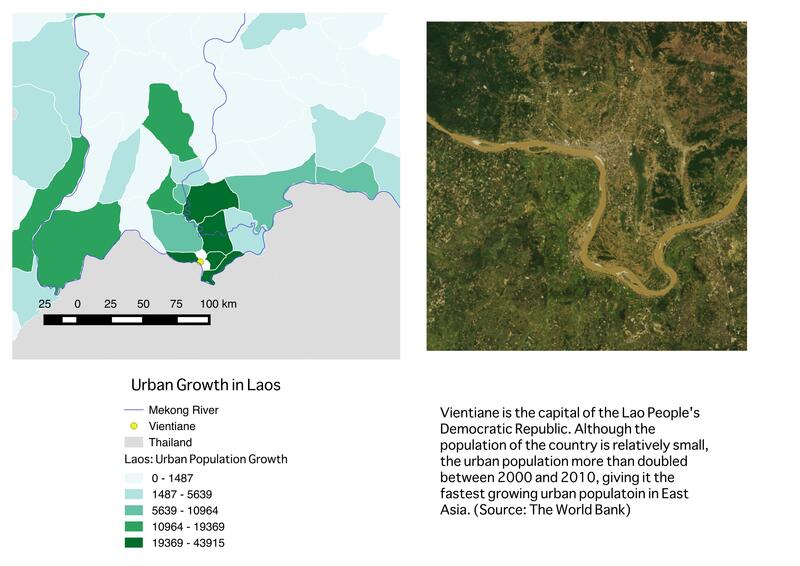 In addition to major growth in small- and mid-sized cities, the fastest growth of urban population was experienced in East Asia’s low- and middle-income countries, namely Laos, Cambodia, and Vietnam. Japan, South Korea, and even Thailand place far behind these countries in their rates of urban land and urban population increase. The less developed countries in the region face administrative and financial challenges on a national level, which creates an environment where a single city in the country, often times the capital city, experiences the majority of the urbanization. The massive, resource-hogging cities that result are known as “primate cities” in the vernacular of urban studies scholars. Concentrating an entire country’s political, cultural, and economic capital in one area creates national vulnerability if there is a crisis in that single city. Urban primacy is especially detrimental for a country when there is massive migration to the core and a development lag in the country’s periphery. This phenomenon plays out the same way in developing countries across the globe: Rural poor migrate to urban areas in search of better economic opportunities, but financially and administratively inept governments cannot provide migrants with adequate resources for finding jobs and homes. Densely populated and amenity-poor settlements result as migrants join the informal economy of the city. Bangkok, Yangon, Phnom Penh, Vientiane, Jakarta, Manila, and Kuala Lumpur have all reached primacy within their respective countries. 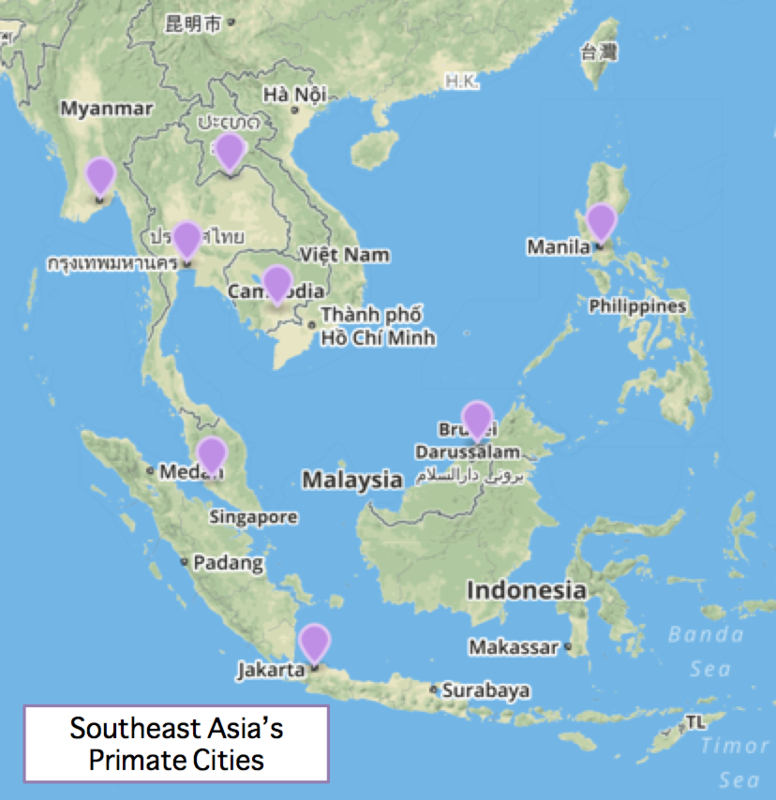 As previously mentioned, Bangkok is one city that has acknowledged its primate city status and attempted to reduce its dominance of Thailand’s geography. Countries such as Cambodia and Myanmar will also need to take steps to ensure that Phnom Penh and Yangon do not morph into unsustainable networks of unplanned settlements. The challenge lies in the fact that countries like Cambodia and Myanmar lack the administrative and financial capacity to shift rural to urban migration trends. However, it is promising that smaller cities in the region are doing most of the growth, even if they have a long way to go before they can compete with these metro areas. 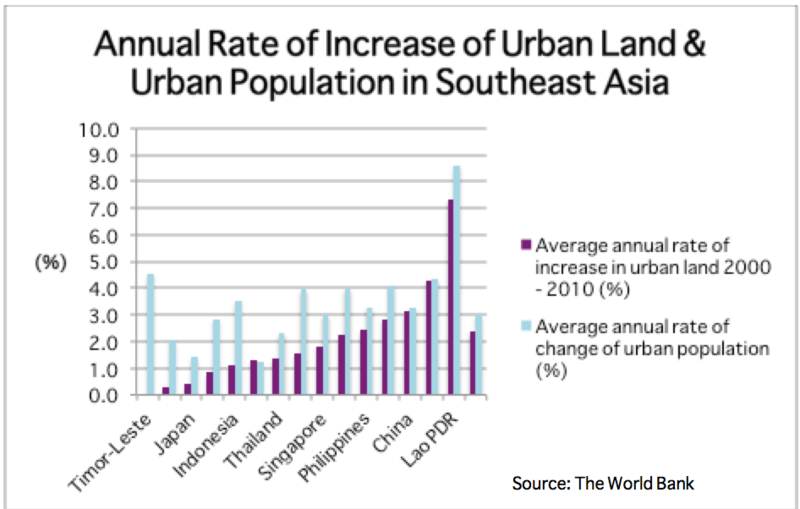 Finally, Southeast Asia’s urban populations are growing faster than the region’s urban land. At present, the main reason for dense urban growth in the region can be attributed to the lack infrastructure available on the periphery – a far cry from the smart growth policies that many cities implement to promote compact growth. Even so, high-density urban growth is associated with many positive outcomes when it is effectively provided for. Namely, high-density development tends to have fewer negative environmental consequences than urban sprawl. Kuala Lumpur is actually an exception to this trend in Southeast Asia, and has been criticized for failing to compact its urban growth. A heavy reliance on automobiles has been detrimental to the city, but other emerging urban areas in the region have the chance to get ahead of the car craze and promote smart growth that emphasizes efficient land use and practical transportation. By and large, dense urban growth still has a number of caveats. As mentioned, the reason density in the region is high is due to a lack of amenities outside of core cities. If population growth outpaces the ability of the core to provide services, the quality of life in many cities will quickly degrade. Overcrowding is also a serious challenge that many cities in the developing world are faced with, and Southeast Asia is no exception. Comprehensive urban planning will be necessary to prevent overcrowding from becoming another major trend in the region. When you combine all of the formulas for urban growth in Southeast Asia, the results are two-sided: There is potential for inclusive, sustainable urban areas, but there is also a chance for the region to mushroom into a clutter of poorly planned development. When planning is neglected, poverty, environmental degradation, and land use conflicts ensure. For Southeast Asian cities to avoid falling victim to, say, the level of air quality degradation that many Chinese cities now face, spatial planning and good governance are crucial. A 2009 assessment of urban governance prepared for UN Habitat is grim: the report asserts that the capacity of both local and national governments in the region is fragmented and weak, with a serious lack of simple management skills and adequate budgeting for necessary infrastructure. 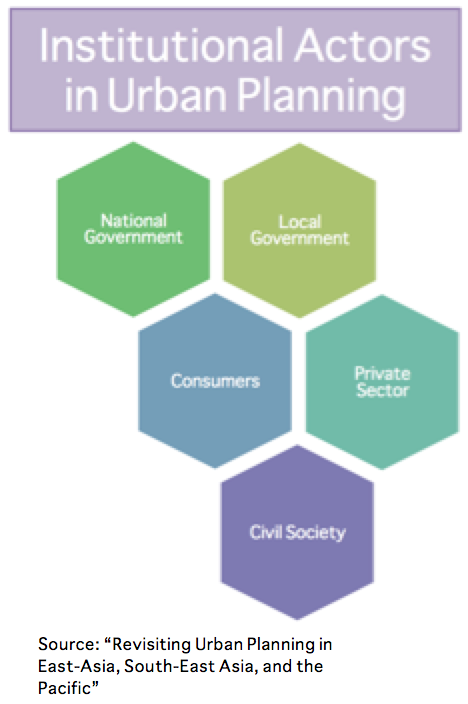 “Good” urban governance requires transparency, political will, and funding, but many Southeast Asian governments underperform in all three categories. There is always a propensity for countries to urbanize, regardless of political stability. With that being said, Southeast Asia’s urbanization trends alone illustrate that not all growth is good growth. A solid political environment at least ensures that there is a structure for discussing urban needs when they arise, although definitive actions need to be taken if there is going to be any change. Administrative fragmentation is another burgeoning obstacle for Southeast Asian boomtowns. This term refers to the spillover of growth from one municipality into neighboring jurisdictions. One example is Manila’s urban area, which spans 85 municipalities and seven provinces. The World Bank predicts that many of the growing small- and medium-sized cities will soon experience this type of administrative challenge, if they are not experiencing it already. Different jurisdictions often struggle to coordinate plans for infrastructure development and management, leaving many areas underserved. The ecosystems impact of such trans-boundary urban areas is also notable because rivers, lakes, and forests require cooperative management. Overcoming administrative fragmentation appears daunting in a region where political stability is scarce, but regional planning associations have proved to be an effective way to manage fragmented urban areas. The Metro Manila Development Authority (MMDA) is one such organization tasked with monitoring urban development, but it struggles with a low budget and limited regulatory power. Even so, the future of many urban agglomerations in the region would look brighter if such organizations were widely utilized. Urban management organizations have the ability to pull multiple institutional actors together when questions arise about different stakeholders’ opinions. Southeast Asia’s urban population has not yet reached 50% of total population, an indicator that more urban growth is still to come. The future of the region’s urban areas will in part be dictated by the trends that have been observed in the past decade, but also by events that remain to be seen. Climate change is one of the foremost worries in the region, but political stability and economic productivity will also play roles in the ability of the region’s cities to develop sustainably. Metropolitan areas in the region need to get ahead of urban growth and expansion in order to take some of the uncertainty out of the future. Climatology experts maintain that no part of the world will remain unaffected by climate change, but Southeast Asia is actually a particularly high-risk area. A number of Southeast Asia’s urban centers falter in climate change scenarios that involve sea level rise, drought, saltwater intrusion, and severe weather events, and famine. As metropolitan areas in the region continue to develop, resilience is a topic that needs to be kept in mind. Cities like Bangkok and Ho Chi Minh need to have planes in place for flooding and typhoon events. Manila needs to ask itself how to feed a metropolitan area of 16 million if crop productivity plummets due to droughts or heat waves. Besides the need for climate change adaptation measures, Southeast Asia also represents a large market for mitigation efforts. By reducing dependency on cars and carbon-based energy sources, the region can bypass being a part of the carbon problem. China and the West used coal to fuel their urban expansion, but Southeast Asia has the opportunity to exclude GHG heavy industries and develop using environmentally sound technologies. As new attempts at international climate treaties are rolled out, it will be interesting to see where many Southeast Asian nations fall on the spectrum of mitigation requirements. Historically, developing countries have been held to lower emission reduction standards than countries in the developed world, but countries like Malaysia and Thailand have potentially reached a threshold where they will be counted among the world’s more developed countries, and thus required to reduced their emissions further. In any case, climate mitigation is good for Southeast Asia if it means that the impacts of climate change on the region will be softer than current predictions. Political stability is also a recurring obstacle for a number of Southeast Asian countries. Years of stability and growth have been punctuated by sudden regime changes that have reduced the level of confidence both Southeast Asian nationals and outsiders have in the region’s governance. Urban planning is an intensely political process, so the status of a country’s national government directly effects urban development. If establishing effective national governments proves to be too much of a challenge for parts of the region, how can we expect urban management to get the attention that it requires? Metropolitan development authorities and NGOs could potentially help cities weather the storm if political institutions fail, but finding consistent, effective governance is critical for the future of Southeast Asia’s cities. Future economic development in Southeast Asia will also continue to shape urban areas in the region. Low-cost manufacturing has played a significant role in growing many of the region’s largest cities, but that may change as smaller urban areas take up lower-technology manufacturing as well. Some suggest that economic outcomes are better in regions where the largest cities take on service industries and high-tech manufacturing and the smaller cities concentrate low-tech industries. However, this is impossible if the infrastructure needs of smaller cities remain unmet. Investment in Southeast Asia’s small- and mid- sized cities is an important step that the region can take to move towards greater economic output. Urbanization in Southeast Asia has reached a clear bottom line: In order to reap the benefits of healthy, innovative urban areas, the region needs to raise its expectations for planning and governance. If current regional urbanization trends continue to play out, there is potential for Southeast Asia to be the home of several highly productive urban areas. Investing in small and mid-sized cities will create robust national economies and capitalizing on dense growth will keep the environmental impact of cities to a minimum. However, if planning and coordination are left on the wayside, the region will be set on a course for vulnerability to any sort of crisis that should arise. In the late afternoon of May 22, 2014–about the time when many people were leaving their offices–many TV screens turned frozen. The tunes behind put many in reminiscence: patriotic songs that once were ubiquitous in Thailand 50 years ago came alive. The screen was dominated by the color of blue with “National Council for Peace and Order” appeared under five logos of the military. A few hours passed, the screen remained the same but a different song was playing. Every channel was painted with the same six words. Occasionally, for another day or two, a young man in uniform–possibly in his forties–sat behind a table and started to read word by word from the sheet of white A4 paper in front of him. As he read along, the screen scrolled down simultaneously to show what was typed on the letter. The next day, the young man was accompanied by a young woman, each had a few sheets of white paper in front of them. They switched to read over a hundred plus names of high position leaders who were summoned by the new Thai leader. These people were demanded to report within 24 hours. At this time, no domestic news was reporting what was happening to Thailand. Much of the updates were acquired via social media and foreign news agencies. Videos of uniformed soldiers’ invasion into many media offices were recorded and posted online. People were furious at what was happening. But they were only those who were following the coup’s movement at every step. Others whose main–and possibly the only–channel of news was the television, remained sheltered with messages by the NCPO. The violence has not broken up yet. 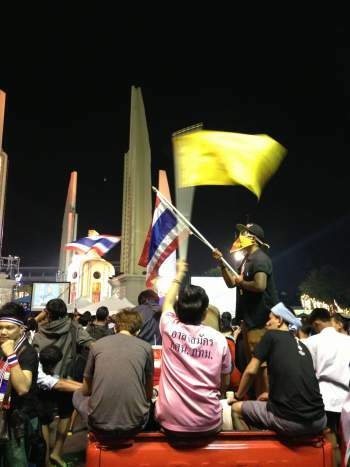 Some wanted their voices to be heard so they gathered by Bangkok’s core to claim their stance. Bangkok Arts and Culture Center became the first occupy, followed by the Victory of Monument, and a famous conspicuous shopping street the following days. The “No-Coup” crowd had their signs written and their mouths taped black. A few hours later, the military came to disperse the crowd and instead claimed the territory theirs with their arms. For the next couple days, Bangkok continued to be surprised by more crowds in various spots around the city yelling “No Coup!” Other provinces started to see crowds gathering in the city centers. “No Coup” movement became contagious. The nation is still divided and fragmented. A week–and months–after the coup’s entrance, every local channel still had NCPO’s logo audaciously pressed at the top right corner. Media was mostly reporting financial news and showing nightly soap operas. Updates on the coup were briefed on May 28, 2014 to foreign media with a strong confirmation that Thailand was too unstable for an election. The last coup last two and a half years before an election of recycled familiar faces. Hidden in the midst of the coup’s dominating scene over Thailand, rural folks and environmentalists are facing another layer of turmoil overpowering their livelihoods. The new authority is pushing Thailand’s newest Power Development Plan and forest/land kleptocratic programs to the decision-maker’s plate while Nature-dependent communities are squeezed off the cliff. Deals are being made behind closed doors and those who dare to say different risk being detained by the armed force. “We will keep our promises. Give us some more time. And our beautiful country will return…” This new song, composed by the coup leaders, has become Thailand’s most played song on TVs, radios, public media. Mornings, recess, mid-days, afternoons, late afternoons, nights, midnights, twilights, dusks, dawns. Six months is how long the coup has taken over. The clock is still ticking. Thailand no longer has a constitution. If you want to hold an event commenting or expressing your different views on the nation’s policy, either ask for a permission in advance or risk being arrested. Or might as well, just self-censor your existence. But some university students can no longer remain patient. 5 students, each wearing a black t-shirt with a word on it jumped between a crowd of khaki uniforms and the stage where Prayuth Chan-Ocha was orchestrating about “drought and water management plan for E-san.” Five persons to challenge the military’s order which prohibits an assembly of 4+ persons group. An index, a middle finger, a ring finger to symbolize your support for the “No Coup” wave. A combination of these components will conceal your freedom in the police and the military’s territory. This is Thailand’s time to test its people. No one knows when fear will stop pressing our faces to the ground. No one knows when curiosity will trigger someone to start questioning reality. Indeed, no one knows if most people will just forget and move on, leaving the minority screaming–in mute. The author of this essay is a concerned Thai citizen choosing to publish anonymously. Part of the spectacle at Democracy Monument. Bangkok has been rocked with the largest political demonstrations since 2010, with protests escalating into isolated pockets of violence. Yesterday’s D-Day is part of the “final battle” by the anti-government protesters, with morning marches from all major rally sites converging at Government House. Prime Minister Yingluck announced that she would dissolve the lower house of Parliament, as a reported 100,000-150,000 protesters flooded the streets of Bangkok and members of the Democrat party resigned. Clashes on so-called V-Day last Sunday left a reported five people dead and 64 injured in the confrontation between anti-government and pro-government protesters, including one who died when a bus was attacked. Over the last two weeks, anti-government protesters occupied key ministries, government complexes and police headquarters. The police attempted to alleviate tensions after the worst of the clashes, as they opened up barricades to major government offices – even offering roses to protesters in a symbolic gesture just days after taunting protesters and firing tear gas at crowds. These protests showcase the complicated intersection of history, social changes, and legitimacy in current Thai politics.